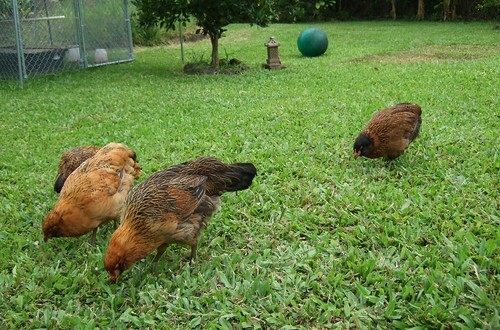 Backyard Chickens, originally uploaded by Eric Jeschke. A status update for loyal readers. Some folks have asked how the chickens are doing. The answer is very, very well. They have grown almost to a size where I don’t really worry about the common predators that we have around here–good and bad, really, that Hawaii has so few. All 8 have survived to adulthood and they have really become integrated into the family life and daily routine. Our dog gets along well with them and we have no qualms anymore about leaving her alone with them. They are really a lot of fun and so far it has been a very enjoyable experience. My favorite camera has just quit on me. This time it is completely dead–unresponsive to any attempts to revive it. I suspect that it got a little rattled going up to 14,000 feet the other day. I often take it with me to the summit of Mauna Kea and it has generally handled it well. I note that this is the third time that I have had major problems requiring repair (twice before under warranty). Even though I love this camera more than any other I have owned (with the possible exception of the Pentax MX), I am growing tired of this sort of brittleness. Although I love the Ricoh size and ergonomics I daresay I will be hard pressed to buy another Ricoh. The good news is that I have a Panasonic GH1 on order. The bad news is that it has been on order since May! In the meantime I’ve had to pick up some old cameras to fill the gap, and shooting with them has reminded me of why I upgraded. I’ll have to decide if I want to repair this one, and if not, I will likely need to pick up another serious compact, because I won’t want to lug the GH1 around absolutely everywhere. Oh, and I lost my $%*)(&%@ brand new eyeglasses! I think there is an Olympus EP-1 is waiting for you somewhere to be manhandled by you (given it meets your small size critera including (a) lens(es), of course). The EP-1 looks like it has a lot of promise, but the it’s AF performance is a deal killer for me. The poor LCD screen doesn’t help. Otherwise, it has a lot to offer and the size is right. Apologize for “critera” (typo, plural), which should have been “criterion” (singular).